I came across another liquid soap thickener that I thought I would give a try to see how it works. 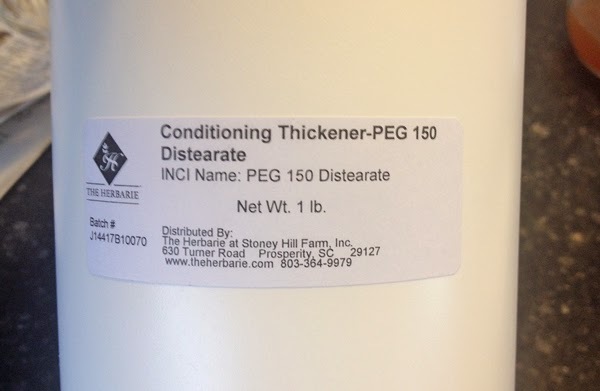 PEG 150 Distearate is available as Conditioning Thickener at The Herbarie and as labeled at Making Cosmetics. Both suppliers indicate different usage amounts, one from .2 - 2% and the other from .5 - 5%. Temperatures to incorporate it vary slightly too. Since I purchased mine from the Herbarie, I will use their temperature guidelines. It is very, very easy to incorporate into your liquid soap and gives an increase in viscosity at 2% and 3%. It also does not cloud your soap allowing it to remain clear. The resulting thickness will also depend on how thick your soap is to start with. These amounts did not create a gel soap, but one that was slightly thicker than the diluted soap that I started with. Here is how to use this thickener in your liquid soap. I am using my liquid goats milk soap that I scent with 3 different essential oils. I have used this thickener on soaps with 25% - 60% coconut oil content successfully. Always try a small amount of your soap to see what percentage gives you the thickness you are looking for. 1. 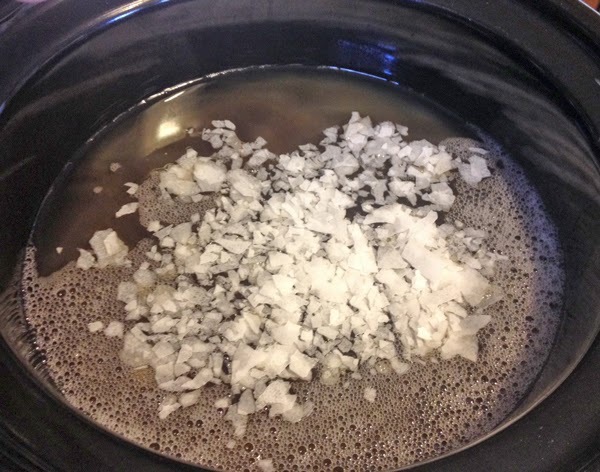 Measure out your liquid soap and pour into a crock pot. 2. Calculate how much PEG 150 Distearate you need and measure that out. 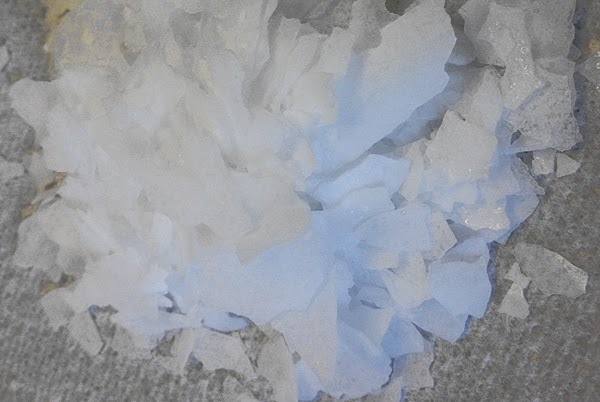 This is in a white flake form and is water soluble. I was thickening 90 ounces of soap and used 2.7 ounces (3%). 3. While your soap is room temperature, sprinkled the PEG 150 Distearate into your soap. Turn on the crock pot to high. 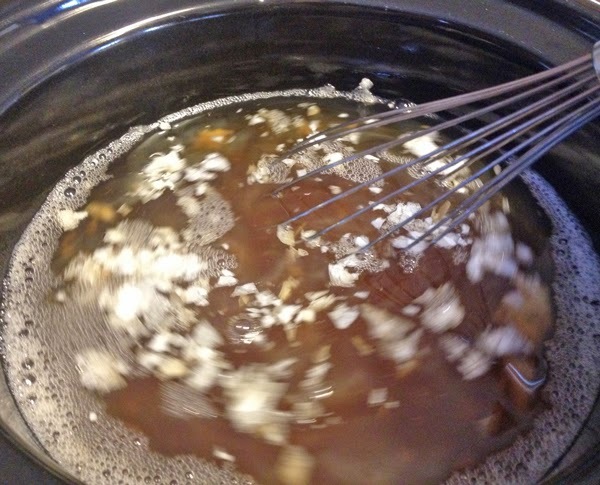 You need to heat the soap to melt and incorporate the thickener. I have not tried adding it to already hot soap. ETA 7/1/17 - I have tried to use this thickener on soap that was heated first then the thickener sprinkled on top and it works just fine that way too. 4. Using a whisk, you will want to whisk it to incorporate several times as it heats up. 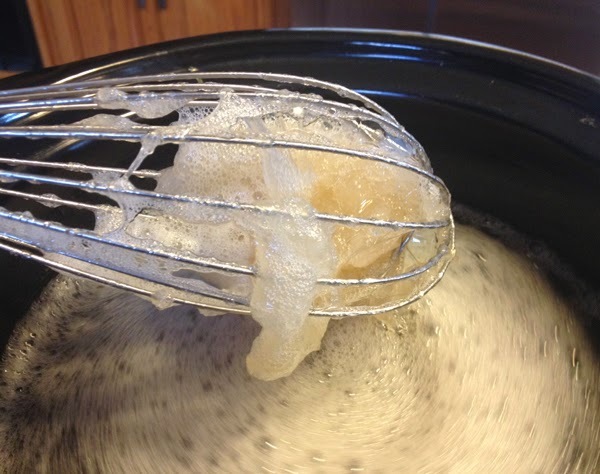 At first it will be a large clump of gunk at the bottom of your crock, but as it heats and melts, it will incorporate nicely. Once you reach about 110 - 120 degrees F, it will have melted. 5. Heat to 176 degrees F (recommendation from The Herbarie) to insure it is fully melted and incorporated into your soap. Making Cosmetics recommends a temperature of 140 degrees F.
6. This is what it looks like as it begins to melt. 7. As you can see, this thickener does not affect the soaps lather. 8. Turn off your crock pot and allow to cool to room temperature. 9. That is it, you are done. The finished goat's milk liquid soap below. 10. 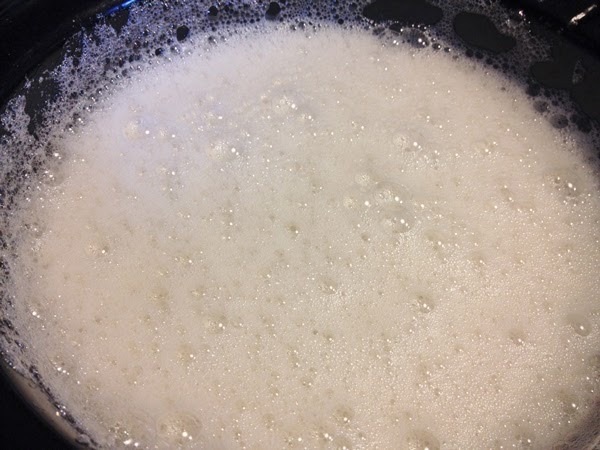 This thickened the soap nicely at 3% but I do prefer the soap to be slightly thicker - like what I can get with HECat 1.3%, however, this was much easier to use. I am hesitant to use it at higher percentages too. 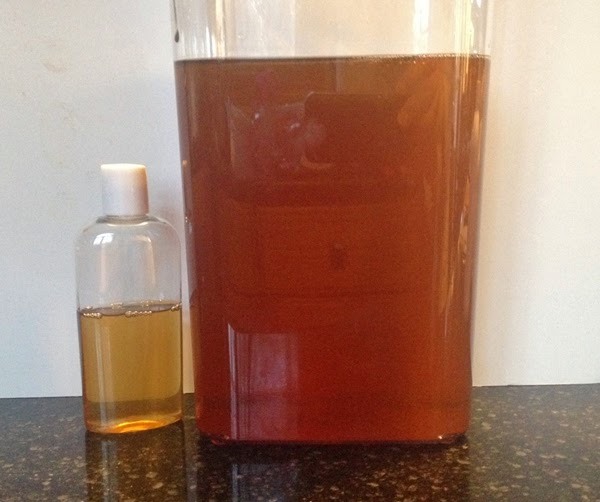 Making Cosmetics also indicates that this ingredient also acts as a solubizer which may explain why my essential oils and fragrances caused absolutely no problems when I added them. In the future, I may combine this with a bit of HEC to get both the thickening and solubizing benefits for my soap. Copyright Alaiyna B. Designs. All rights reserved. All text and images are the property of Alaiyna B. Designs and Alaiyna B. Bath and Body. No part of this document or webpage may be reproduced by any means without prior written consent of Alaiyna B. Designs. Hi Faith. If you combine the HEC and PEC, what percentage will you use of each.? Hi Zanet - I have not yet experimented with using both thickeners together in the same batch so I do not have an answer to that question.